Growing up I used to play on a bowling league called the “Out to Lunch Bunch”. We would grab lunch at the local bowling alley then bowl 2-3 games together. Such fun memories! How fun would this be if a group of kids and their moms create their own fun and did this over the summer together? Talk about fun playdate! And if this past week is any indication of how hot this summer will be, this lil hot tip will help you plan for some an indoor activity at a price you can’t beat! Free bowling for kids all summer long! Kids registered in the Summer Unplugged program can bowl two games per day, every day, all summer long from open until 8pm! 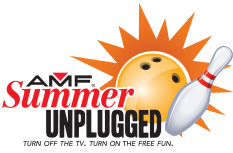 If you live near an AMF bowling alley, be sure to check out the AMF Summer Unplugged program! 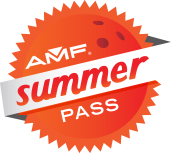 Adults can also join in on the fun and grab an AMF Summer Pass for $34.95. It includes two games per day for you and up to three guests ages 16 and up, from open until 8pm. How easy of playdate is that! Learn more and sign up for AMF Summer Unplugged here.